Schools will not be replaced by technology, but schools that don’t use technology will be replaced by those who do! The pressure of education is not only felt by the students, but also by the teachers. Apart from teaching and constantly assessing, evaluating tests is one of the most cumbersome tasks that the school faces. That is why we have created an intelligent digital platform that will reduce the assessment lifecycle time of your school. SchoolEra is a unique, CBSE-certified learning management solution. It automates the process of creating tests, assessing results and monitoring progress of students. It is easy-to-use and can be assessed anytime, anywhere through any device. SchoolEra intelligent solution makes the process of learning and assessment simpler, faster and more efficient than ever before. It is highly interactive tablet based platform that benefits teachers, students and parents alike. SchoolEra as a strategic partner to schools has done some fantastic jobs in last 60 days. The teacher’s tablet can be directly connected with existing hardware like LCD/LED, projector etc. Geetanjali Global School – Now 66 teachers and students are happily using it to make their lives easy Frontline Millennium School – 33 teachers and students are using School- Era tablet solution to shortening the assessment lifecycle time and many more! Get all the benefits of SchoolEra on your android smartphone with the SchoolEra mobile app. SchoolEra on mobile gives the freedom to keep track of what’s happening in the classroom all the time. Our easy to use interface allows teachers to share notes and homework with students. Students can check the class notes, do practice tests and get alerts of pending assignments no matter where they are. They can even submit their assignment and assessment on the go! SchoolEra allows automated creation and evaluation of assessments. 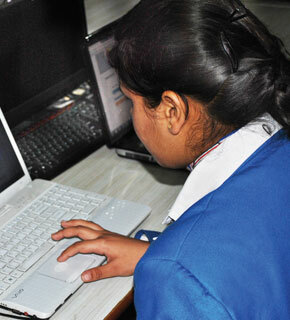 Even parents can also keep a check on their child’s performance and be in touch with the teachers over email and SMS. SchoolEra is doing wonders in more than 1,000 schools and helping 200,000+ students across the country. We have published the gradebook for schools like Columbia Foundations, Adriel High School, Oxford Public School, Saffron Public School, NCC Senior Model School and many more. Now more than 15,000 parents have witnessed their child’s performance and received gradebook on their mobiles through SchoolEra app. Receive instant notifications about homework, exam, results, circulars etc.